Its way too hot for heavy meals these days and I normally don’t like boneless chicken breast, but Michael loves them so I am constantly on the hunt for a recipe that I can enjoy as well. Dozens of recipes popped up when I added Sriracha chili sauce to the search. I adapted Recipe Girl’s version, link below, tossing in fresh ginger onion, garlic, lime juice, zest and changing the preserves to apricot preserves…I marinated the chicken for several hours and I was very happy that they were not at all dried out, juicy tender with a touch of heat from the Sriracha which I increased slightly. 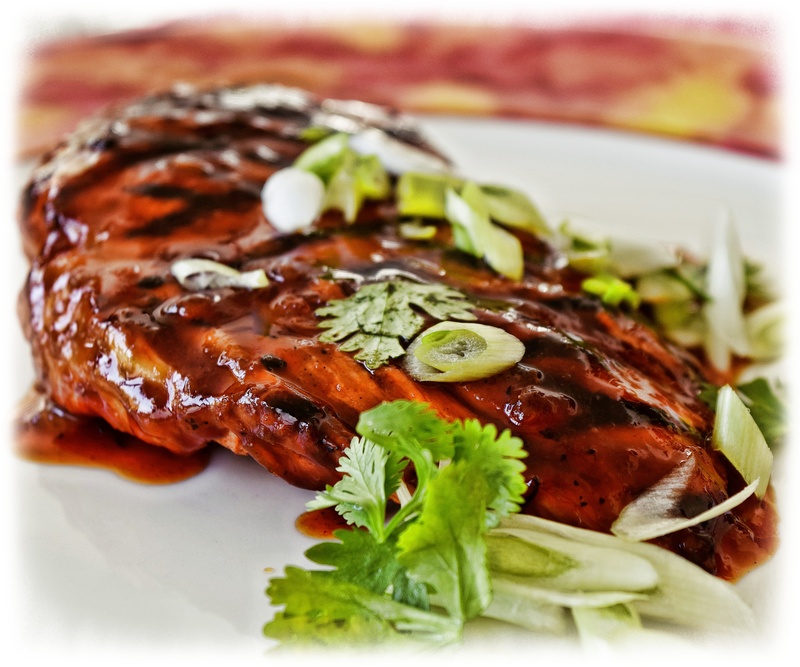 Whisk the Honey Sriracha Orange Marinade/Glaze ingredients together in a medium bowl. Add 1/3 cup to a large freezer bag and whisk in 1/4 cup olive oil. Add the chicken and marinate 60 minutes…I think overnight is too much 6 hours is plenty. When ready to grill, let the chicken sit at room temperature for 15 to 30 minutes. Prepare the grill and preheat to medium high heat. Save a few tablespoons of the reserved glaze to brush over chicken . Add the remaining glaze to a saucepan and whisk from time to time to reduce and thicken slightly about 5-7 minutes. Set aside. Drain the chicken from the marinade and pat dry. Grill the chicken undisturbed for 5 to 6 minutes per side, or until chicken is cooked through, basting with the 3 tablespoons separated glaze. While the chicken is grilling, heat glaze to a simmer. Whisk until thickened. Once thickened, brush the cooked chicken with glaze. Spoon the extra glaze over the plated chicken or use as a dip.